Hey friends, it's my turn to share a gift for co-workers. Problem is, I don't have any co-workers...well, technically my husband is my co-worker but (his gift will be shared in a few weeks) I didn't think that's what we were going for. My husband has a co-worker. Yup, just one. He has an amazing secretary and as with most secretary's without her the show wouldn't run so smoothly! So, I decided to put together a little gift bag of sorts for her. It will include some items that I hope will help her know how much she's appreciated and give her something useful. Problem is...I don't have it all done yet. Time gets away from me and I am so sure I'll be able to make TONS of Christmas gifts instead of buying them but I end up buying more than I want to when all is said and done. Most of my Christmas gifts are half done and just waiting on me to finish them. Helen loves to read, so I am going to make her a bag with her initial on it (more on that in a second), a bookmark and I've also been thinking about putting in one of my felt coffee mugs with a Starbucks gift card. I love giving gift baskets with coordinating gifts. However, sometimes they can get pretty expensive. This basket will be full of useful homemade goodies. Maybe I'll even throw in some homemade cookies or fudge! So, I have a quick tutorial for you on the bag, the idea came from here and it's the same one I shared when I told you about teachers gifts. I went ahead and made three bags because I'll use one for Naomi's teacher, one for Greg's secretary and I'll have another one to use for whomever I need a gift for still. I got the bags at Jo Ann's and I think I got all three bags for like $5. 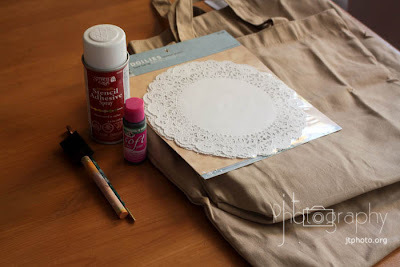 Then you also need stencil adhesive or repositionable spray adhesive and some doilies and fabric paint. Spray the doilies, and let them dry. It should be sticky before you put it on the bag. 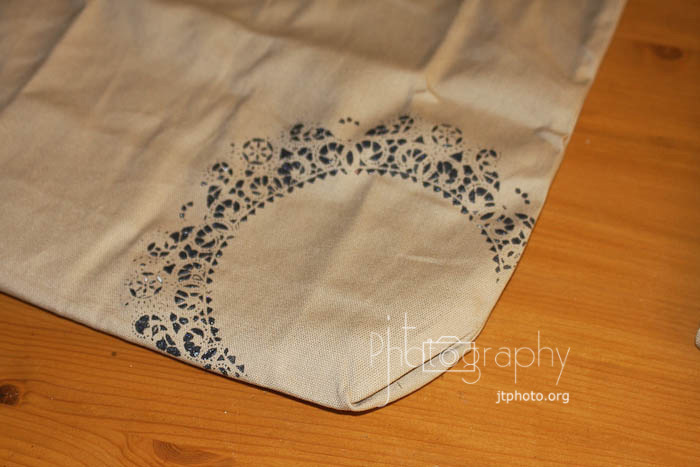 Then paint on the doilies, you could probably paint just outside the doilies too but I decided not to. 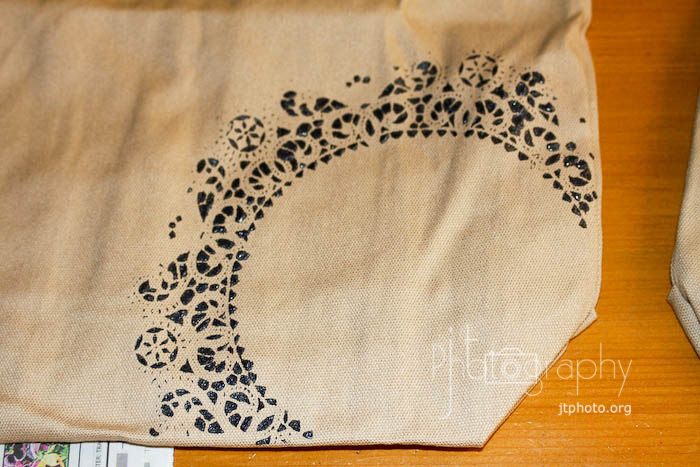 Peel the doilies off and viola..you've got a super cute bag. 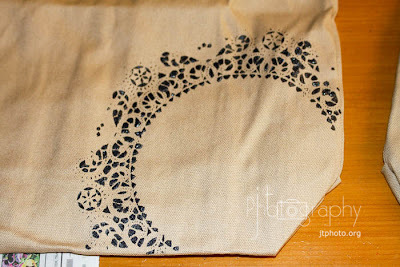 Then when that is dry use some freezer paper to make a stencil and paint your monogram or initial on the bag. I don't have that part done because again, only part of my gifts are finished. Sorry for being a slacker! 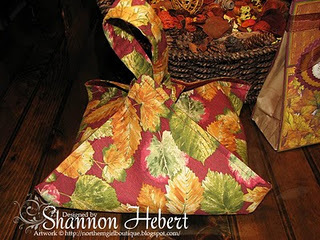 Then fill the bag with goodies, tie with a ribbon and give to your sweet co-worker! Quick question for you all...if the bag did not have your monogram on it, and just had one letter, would you prefer your first inital or your last initial? 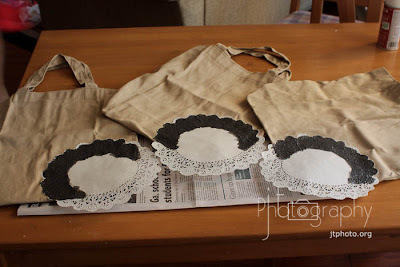 I'd really like your opinion on this one since I'm torn and dont' know which one to do for my husband's secretary. My other thought would be to make a casserole carrier, like this one. There are a bunch more here. For sure the first initial. You have such amazing gift ideas! 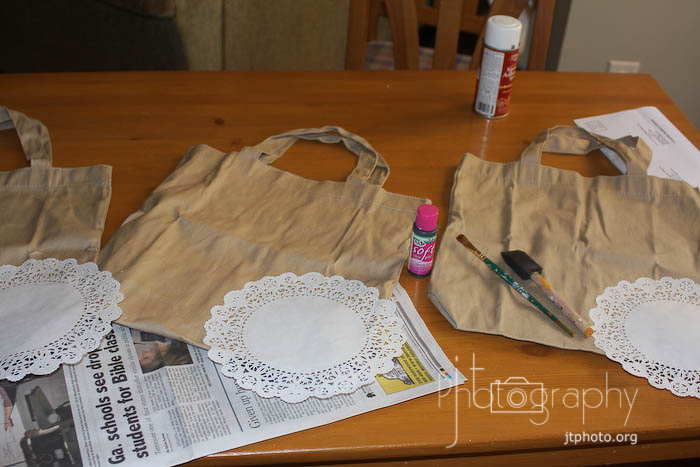 They are simple, and make use of so many reusables - but are things that I would have never thought of. Thanks for posting your wonderfuls!